Sergey Troyeglazov acted as a Program Manager at the “AS AKTIV” Regional Youth Public Association in Kazakhstan from February 2014-May 2016. At “AS AKTIV” Sergey was in charge of activity planning and sequencing, monitoring and evaluation, strategic planning, resource planning, and documentation. He has also engaged on a multi-city report documenting the struggles and human rights abuses facing LGBTIQ people in Kazakhstan, which was presented in Astana in 2016. Sergey has also served as an intern for OutRight Action International, where he focused his efforts on research, translation, and ensuring that the organization was abreast of the evolving crackdown faced by gay and transgender Chechens. Sergey: As a gay man living in Kazakhstan which, is Muslim country, I experienced a lot of discrimination and harassment myself. It began during high school years and had been continuing until I had to leave my home country. In 2013 I became a volunteer activist at AS “AKTIV”. This organization was Youth Public Association lobbying LGBT-interests, Human Rights, increasing civil engagement and tolerance in The Republic of Kazakhstan. In 2014 I joined organization as a board member, and continued my work mostly as project manager of organization, helping with grant proposals writing, projects developing and carrying out. In October-November 2015, participated in ILGA Europe Annual Conference in Athens, Greece. During the conference I represented organization AS “AKTIV” and LGBT issues of Kazakhstan and Central Asia. During Fall 2015 – Winter 2016 I participated in a research group within AS “AKTIV”. The subject of research was “Studying of The Level of Tolerance towards LGBT-community in Kazakhstan. During this research I alongside other organization member visited 5 major cities of East Kazakhstan and former and present capital cities of the Republic, gathering necessary data for our study. The results of the research were presented with support of US Embassy in Astana during the round table in January 2016. The research results are in public access now. The research gained a lot of public negative reaction. Local journalist called this gay propaganda. Many articles were published, most of them were negative. We started to receive threats and Kazakhstan Intelligence Service (KNB) constantly tried our organization members and even our family members. Many incidents happened including KNB people broke in our apartment. Sergey: US and European countries’ political activity transcended national borders through global movements and NGOs. Our organization was able to operate only with the help of international foundations. Local foundations and Kazakh government would never support LGBT organization neither financially and politically. Sergey: First it would strengthen my skills in non-profit sector for my future work and activity in my country, would help me to make new connections with international activists to understand LGBTIQ advocacy strategies and problems on a global level. The summit will give me one in a million the opportunity to meet international activists and foreign governments representatives and discuss critical issues affecting the LGBTIQ movement. As an LGBT activist, I always seek for new opportunities. 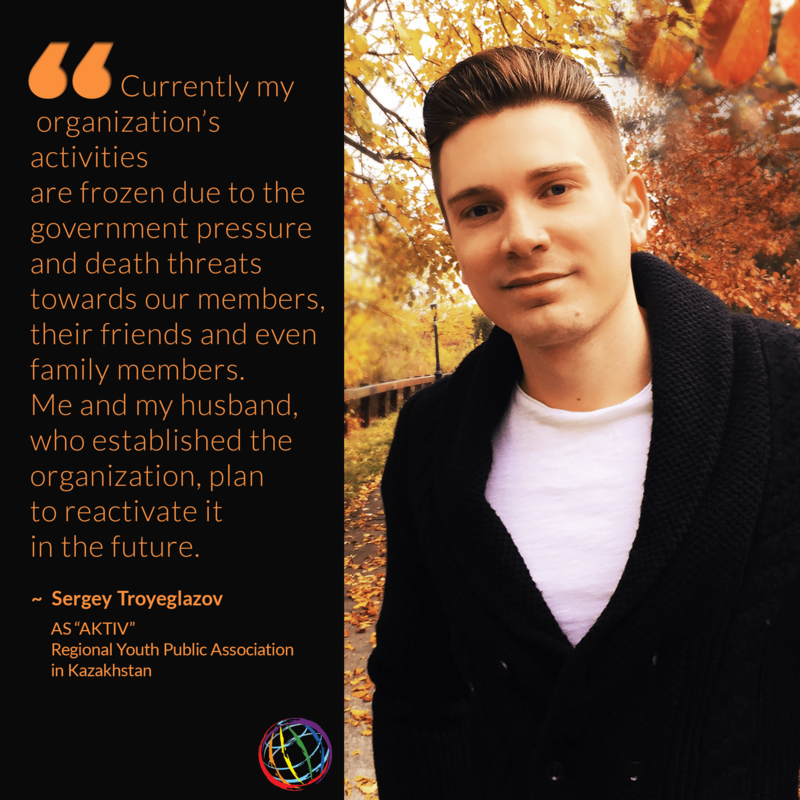 Sergey: Currently my organization’s activity is frozen due to the government pressure and death threats towards organization members, their friends and even family members. Me and my husband, who established the organization, are in US currently, planning to reactivate the organization in future, running it remotely.